I have to admit, I have no clue what I’m doing when it comes to preschool potty training. We were almost there… except for the pooping thing. Then, of course, there was the whole potty training progress being completely undone. The day before yesterday, I was ready to cry uncle. I was done. I’d decided to just give in and accept the fact that Norton would wear diapers until university. I was tired of everything being a fight. I know that part of the frustration with preschool potty training is that Norton just plain does not care if he’s wet. Or if he’s poopy. Or if he stinks. It’s kind of funny: last summer, if Norton fell in the dirt, he’d cry for me to come help him up. He didn’t want to touch the ground and get dirty. Now? He has become such a boy that he could roll in the sewer and not really care. That had more than a small amount of impact on his lack of interest in preschool potty training. I wasn’t sure what to do. I tried getting him to to potty. However, he managed to hold his bladder for eight freaking hours. I was beyond done. I threw my hands up in the air and put him back in a diaper. Then there was yesterday. I pulled his overnight diaper off with minimal fighting. He ran around naked and went potty. He went outside and played in clothes and underwear. No accidents. He actually told me “pee pee potty!” a couple of times. We had exactly one accident the entire day. And that was with him wearing underwear some of the time. How long did it take for your little to have potty training down pat? We’ve had a lot of trials and tribulations with potty training. Considering our early successes with elimination communication, I never dreamed that Norton would be in diapers at the age of three. Heck, I figured we’d be done with potty training (and diapers) by the time he was two. After a lot of struggles, we had Norton very nearly potty trained. He was happiest wearing his Cars underwear and would go “pee pee potty” on his own. Mind you, we were getting absolutely nowhere with getting him to “poop in potty,” no matter how many nifty potty chairs we bought him or how many times we watched Elmo’s Potty Time. When he had a bout with diarrhea at the beginning of June, our potty training efforts were shot. I gave up and put him back in diapers after having to shampoo the couch. In hindsight, that was probably a mistake. I would have most likely been better off keeping him in underwear but putting a Bummis cover over to protect from poopsplosions. But I didn’t, and now I have to deal with the consequences of that decision. After the diarrhea cleared up, he refused to use the potty at all. All the ground that we had made up was completely and utterly lost. On Tuesday, he asked to use the potty. It was only once, and he went. I was thrilled. I had decided that we were going to try the three day potty training method on Wednesday… and found that he had explosive diarrhea that flooded the bed. Once again, potty training plans were derailed. At this point, I’m beginning to think that we’re going to be in diapers forever. Maybe, if I’m lucky, we’ll get potty training done before he gets to university. Maybe. Have you struggled with potty training? How did you finally get it done? Preschool Meltdown – Can We Be Done? *sigh* I’ve known for quite some time that Norton has a temper. Of course he does. He’s my son. And his Grumpy (paternal grandfather) also has a temper. It’s not like he doesn’t come by it honestly. 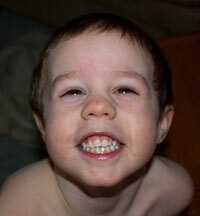 However, the preschool meltdown phase is going to make me lose my mind. I’m finding a preschool meltdown to be far worse than a toddler tantrum. I have to admit that at this point, I hate that Pillow. I have fantasies about burning that stupid thing because it’s the biggest cause of a preschool meltdown in our house. He constantly puts it down somewhere in the house and can’t remember where and then freaks out over it. The reason that he’s sobbing for Pillow right now is because after days of trying to surreptitiously slip Pillow into the washing machine (because that thing reaked like pee from overnight accidents), I finally told him today that Pillow needed a bath. I expected a fight, but he gave it to me. I guess because he was aware of the extremely unpleasant aroma eminating from Pillow. The preschool meltdown happened because he slipped in the laundry room behind me while I was putting Pillow in the dryer. Out of desperation, I let him hug Pillow, hoping that he’d give Pillow a kiss and let me toss the stupid thing in the dryer. Instead, he clutched onto his soaking wet Pillow like a drowning man hanging onto a life preserver. And the sobbing started. “Oh, no! What happened?” I tried to pry Pillow out of Norton’s grasping fingers. It didn’t work. Finally, Norton gave Pillow to his daddy. However, there was 20 minutes worth of sobbing as Pillow was in the dryer. When he got Pillow back, his relief was just so evident. He gave a half laugh/half sob and cried “Pillow!” And then snatched the blasted thing from my hands and held it tight. Did you deal with preschool meltdown issues in your family? How did you handle it? 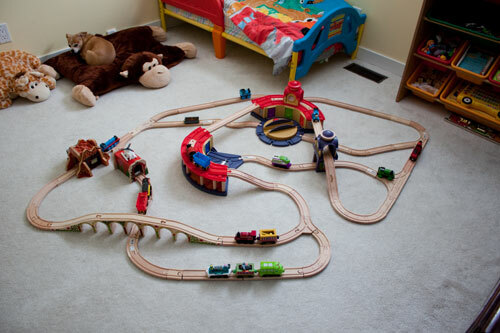 Now that our wooden train track layouts are so very elaborate, I don’t have enough time to build one every day. Here’s the first Train Track Tuesday layout. Train track elements used: Chuggington Double Decker Roundhouse, Chuggington Wooden Railway Koko and Hodge’s Clock Tower Set, Thomas and Friends Wooden Railway Echo Tunnel, Maxim tunnel, Maxim Viaduct bridge.